Structured by key trends, Freedom on the Net begins by presenting this year’s most prevalent theme: That online manipulation and disinformation tactics rose dramatically, and played an important role in elections in 18+ countries (including free countries like the United States). While we’re used to seeing more repressive regimes like China and Russia actively attempt to censor their population’s consensus (via Internet censorship) to favor their own opinion, the difference between past state-led interventions to what’s currently occurring is that their efforts appear to be catching on – and going global. Furthermore, these methods of censorship are becoming increasingly hi-tech. With bots, propaganda producers, and fake news outlets exploiting social media and search algorithms, “opinion shaping” – and thus censorship – is reaching a wider audience than ever. Mobile Internet Activity: Mobile Internet service disruptions and shutdowns increased, with over half of shutdowns reported as “mobile-only” disruptions. Mobile is increasingly targeted as it’s the primary mode of Internet access worldwide; traffic from mobile networks surpassed that from fixed-line in late 2016, and many developing nations use mobile due to its availability and affordability (does not require infrastructure). These shutdowns were under the guise of political and security reasons, and have a disproportionate effect on already-marginalized people and those who may be challenging the government. Live-Streaming: Restrictions placed on live video increased, as these platforms are often used to live-stream political protests. By restricting live video, governments aimed to prevent the spread of protest and images of civil unrest from reaching mass audiences. Technical Attacks: Cyberattacks are certainly on the rise, and continue to be perpetrated by governments and individuals alike. These attacks, which include DDOS, hacking, and disabling online accounts, are relatively inexpensive in nature and are increasingly used to target opposition forces whether they be news outlets, politicians, human rights defenders, or otherwise. Virtual Private Networks (VPNs): VPNs are used to circumvent censorship and Internet restrictions in oppressive countries, making their use an indicator of Internet freedom or lack thereof. This year, 14 countries restricted VPN connections in some fashion, and of those 6 countries introduced new VPN regulations or legislation within the past year. Physical Attacks: Governments continued to attack netizens for expressing themselves “too freely” online, or making controversial, anti-government or explicit comments deemed “forbidden.” Physical retaliations for this online speech increased by 50% over the past year, with violence escalating to murder in 8 nations. At Golden Frog, we are strong proponents of Internet freedom. 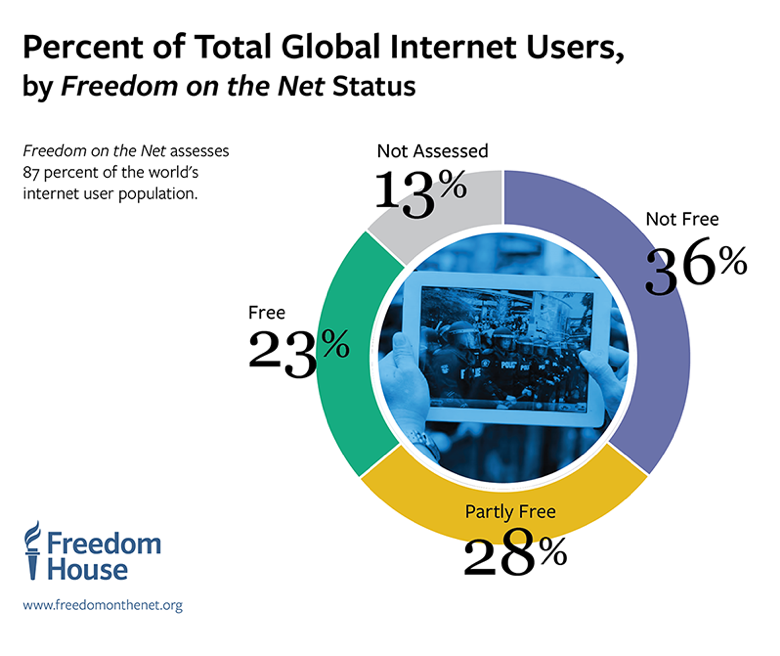 Education and awareness are key when it comes to defending the Internet, and we were proud to partner with Freedom House and collaborate on this year’s report. We’re concerned that Internet freedoms continue to decline, and worry about the state of the Internet. This year’s report only illustrates how essential it is to continue the fight against censorship, and work towards reversing the trend.